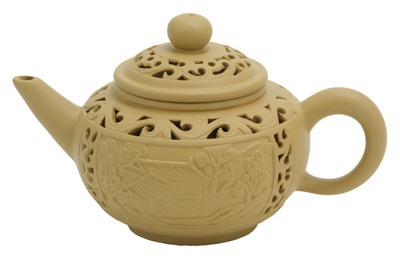 This stunning Yixing teapot is made in Jiangsu province, an area situated 120 miles northwest of Shanghai China. 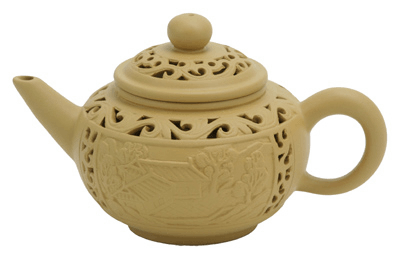 This small double wall teapot has an imperial Chinese courtyard design on the body. This teapot also has an internal filter at the base of the spout. Produced from CNCA-certified factories, meets FDA standards. For centuries, the Yixing teapots are known to be the best vessel for brewing tea. 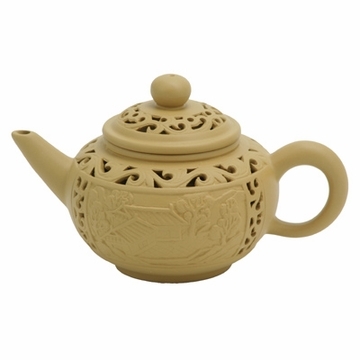 With continued usage the clay, from which the Yixing teapots are made, will absorb the aroma and flavors of your tea. They have the ability to withstand high temperatures and are slow to conduct heat; therefore, the handle remains comfortably cool even when pouring very hot tea. Throughout the ages they are renowned for their unique artistry and practical usage by incorporating the concepts of aesthetic beauty and natural harmony. 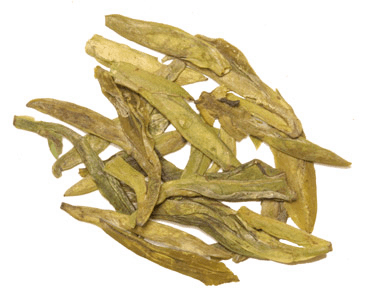  Click here for Chinese Gongfu Tea Accessories.  Click here for oolong teas. This was a gift for a friend of mine. He recived it in perfect order and loved it! The packaging was very good and everything came in perfect order! The choice of wrapping paper was also very well recived! All in all I'm very happy with this order.